It’s a crossover/mash-up that someone should have put together years ago, it’s so obvious. 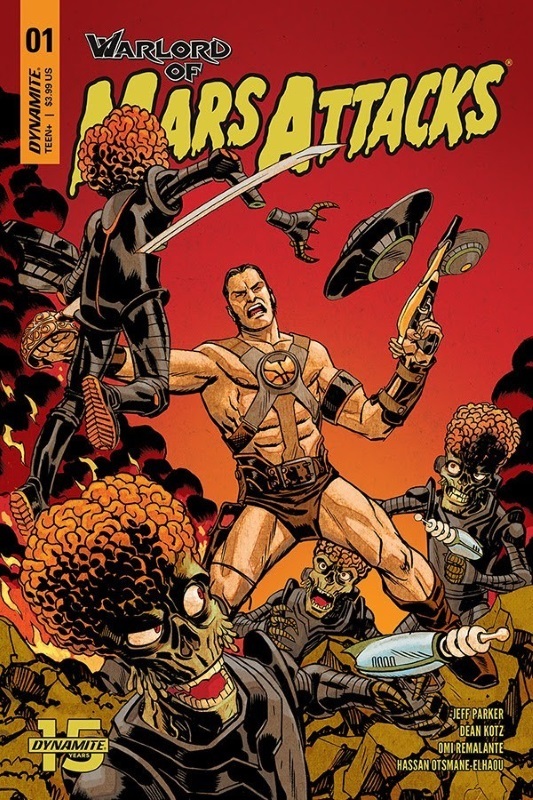 WARLORD OF MARS meets MARS ATTACKS? Of course it’s going to be called WARLORD OF MARS ATTACKS! And, as I like a bit of Edgar Rice Burroughs’s Martian Warlord (more so than those chattering, big brained guys) I’m tempted to pick this up in a couple of months. Back on my old blog, I ran a series of related posts on Mondays and I’ve been wanting to do something along those lines here. So, and I admit to being HUGELY influenced by the wonderful Super-Team Family blog which has been doing this for years (and a lot better) on an almost daily basis, I’ve mashed up a few comic covers. Each week I randomly generate two years and two months and then compare the titles I own from both those dates, trying to find some covers that, with a little basic photoshopping, I can mash together, and then I force the results on you lovely people. Okay, I will hold my hand up – the Super-Team Family blog influence is now in full effect. The last mash-ups I’ve done have all taken one or more characters and inserted them into the cover of another series; it took me nine attempts to work out that Ross over at Super-Team Family is actually creating his own covers by combining the characters into something new, not an existing cover. I hope he and any of his readers that happen to see this and the following mash-ups as respectful homages. Who would you rather see as the new Green Lantern? 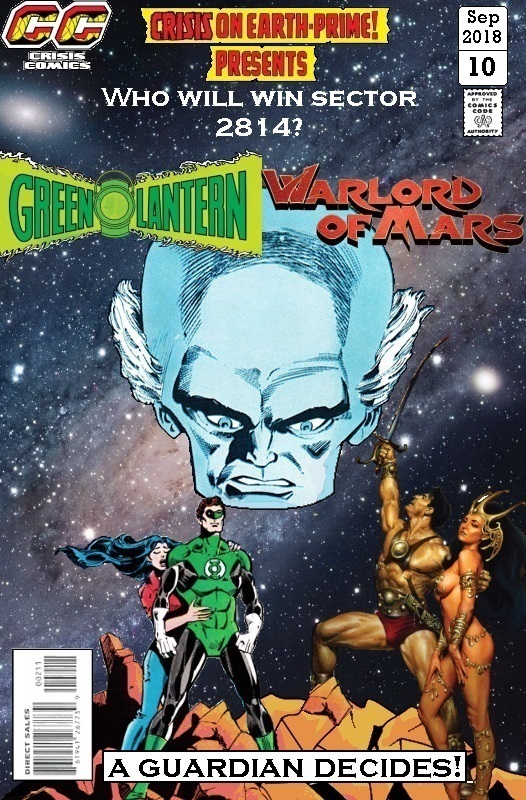 Hal Jordan or John Carter? Hell, why not Carol Ferris or Dejah Thoris? Posted on Monday, September 10, 2018 Monday, October 15, 2018 by GaryPosted in Mash-UpTagged Carol Ferris, Dejah Thoris, Green Lantern (Hal Jordan), John Carter. We gave Dejah a whole new story here. It’s in continuity, she’s not a different character, but she’s forced to put away everything and everyone she knows, and go live incognito as an entry-level soldier in the middle of nowhere. Of all the story directions, this is the one I think could be a real game-changer for the character. What happens when a princess who has everything, has to leave it all behind, even her name, in shame? To go fight a border war in a desolate land? The fact that it’s “in continuity” is interesting and leads me to wonder what effect that will have on the John Carter: Warlord of Mars series that I’m also reading – is that story going to reflect Dejah’s apparent disappearance from Helium and if so, how’s that going to affect Carter? Interesting times ahead, I think. Posted on Friday, November 27, 2015 Friday, November 27, 2015 by GaryPosted in NewsTagged Dejah Thoris, John Carter.